KABUL, Afghanistan (CNN) -- Civilian casualties resulting from Afghanistan's war have spiked, jumping some 24 percent above figures from last year, the United Nations reported Friday. 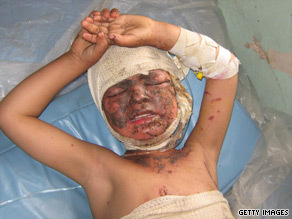 An Afghan child allegedly hurt during a U.S.-led air strike earlier this year. The Human Rights Unit of the United Nations Assistance Mission in Afghanistan announced it recorded 1,013 civilian deaths in Afghanistan during the first six months of this year. That compares to 818 Afghan civilians who were killed during the same period in 2008, while 684 civilians were killed during the first half of 2007. Insurgent roadside bombs and suicide attacks, as well as air strikes conducted by U.S. and NATO forces, are the two deadliest tactics being used in Afghanistan. Fifty-nine percent of this year's civilian casualties resulted from insurgent bombs. Western military airstrikes killed 30.5 percent of the civilians. The report concluded that Taliban insurgents are "basing themselves in civilian areas so as to deliberately blur the distinction between combatants and civilians, and as part of what appears to be an active policy aimed at drawing a military response to areas where there is a high likelihood that civilians will be killed." The UN highlighted a pattern of deadly Taliban attacks, targeting humanitarian workers, government employees, medical and educational staff... and in particular, girls' schools. Meanwhile, the UN noted that NATO forces have redrafted their tactical directives, in an effort to reduce civilian casualties. Despite the creation last year of a military commission to track civilian deaths, Western airstrikes "remain responsible for the largest percentage of civilian deaths" attributed to foreign troops in Afghanistan. The UN stated that these civilian casualties are counterproductive for the Western military coalition, because they are "undermining support for the continued presence of the international military forces and the international community generally." The United States has nearly doubled the number of American forces in Afghanistan since last year. US-NATO troops have mounted on of the biggest military operations of the eight year war, in an effort to route Taliban insurgents from safe havens in Southern Afghanistan, ahead of August 20th presidential elections. The intensified military activities have contributed to making June the deadliest month for Western forces for the war. At least 44 American service members died in the conflict zone this month, in addition to some 29 Coalition forces.